Atletico Madrid failed to go top of the Spanish La Liga after suffering a 2-0 loss against Real Sociedad. One of the best players in the game was former Arsenal forward Carlos Vela, who managed to score a penalty and create another in the 90 minutes. A much needed win by Atletico, to help them advance to the top of the La Liga’s table last Saturday was thwarted by a Real Sociedad team, heavily inspired by Carlos Vela. The 2-0 win came as Carlos Vela went on to score one penalty, and win another for his team. 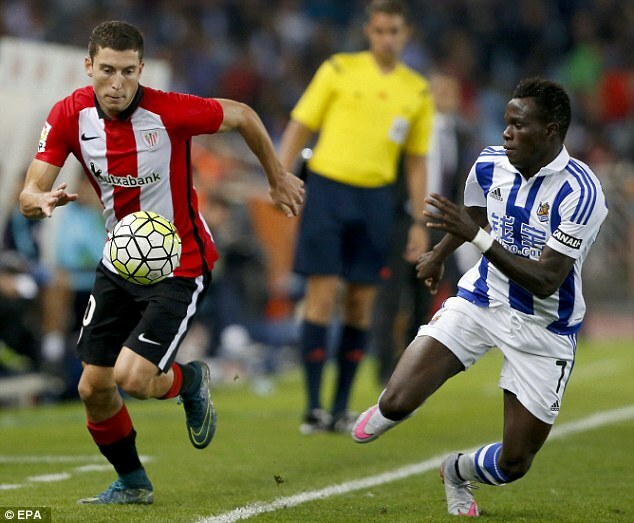 Athletic Bilbao is set to do battle with Real Sociedad this weekend in the La Liga. Real would be playing visitors and hoping to win or at least get a share of the points. On the other hand, the hosts would be hoping o get their fourth home win. Bilbao lost their last game against Malaga 2-1. They would definitely be hoping that they get their season back on track. The loss to Malaga meant they dropped to sixth position in the league, and the side would be happy to avoid a back to back loss this term. Real Sociedad trounced Real Betis 1-0 in the La Liga with Carlos Vela scoring the only goal of the match. The victory becomes the third for Betis in the League. A poor back pass from Inigo Martinez almost allowed the visitors go up early in the game but Sociedad goalkeeper Geronimo Rulli was alert. The hosts made a serious attempt nine minutes to the short recess as Willian Jose headed an Asler Illarramendi’s cross. Antonio Adan stopped the goal-bound effort by making a one-handed save. Carlos Vela was left out of the Mexican team that will face El Salvador and Honduras. The Real Sociedad striker was already left out of the team that participated at the Copa America and was hoping that he will be featuring in the team for the World Cup qualifiers. With Javier Hernandez and Peralta out injured, Carlos Vela believed that this would be his chance to get back in the team, but the national coach did not call him. Boca Juniors failed to make it a record equalling seventh victory in the South American equivalent of the Champions League – Copa Libertadores – after their defeat against Independiente del Valle. The Ecuadorian side managed to get a 2-1 lead from the first leg. Even though Boca Juniors were confident of making a strong comeback in the second leg at home, they failed to do so and ended up losing 3-2. Striker Carlos Tevez was expected to have a major impact in both these games, but he failed to score. Manager Guillermo Barros Schelotto claimed that the striker was depressed with his inability to help the team win the Copa Libertadores. The defending champions of the men’s Olympic football event have crashed out of the tournament. Mexico lost their last hope of making it on to defend their title when they slumped to a narrow defeat to Korea Republic. The Group C games were very competitive, yet many fancied the defending champions to at least get a quarter final ticket, but it seems the other teams wanted it more. Carlos Vela may have to look for another club during the summer. Indeed it has been a poor season for the Real Sociedad player as not only his performance with the team has been poor he has also not been selected for the Copa America. Mexico defender Paul Aguilar says the national team side of Mexico playing at the Copa America does not miss the duo of Carlos Vela and Giovani dos Santos at the tournament. He admitted that they were great for conversations in the locker room but they had capable replacements on the field hence the team didn’t miss much of them. Atletico Madrid coach Diego Simeone wants Argentine veteran Carlos Tevez back in Europe to play next season. According to reports TMW, Simeone is keen on the former Juventus, Manchester City and Manchester United player. Tevez who was omitted from the Argentina’s Copa America team currently playing the continental tournament, is currently with Boca Juniors and is due to remain there till June 2018, based on his current deal.